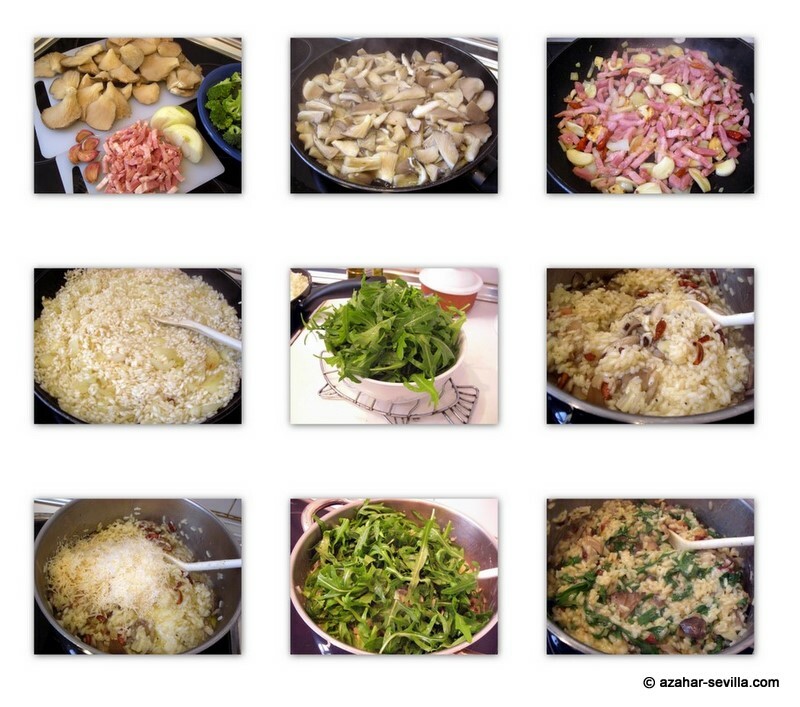 Another “accidental” risotto, which came about after seeing some lovely chopo mushrooms at the market yesterday. And then the guy made me an offer I couldn’t refuse (just before closing time on Saturday is a good time to hit the market). These chopos were cultivated, which don’t have the same deep flavour as wild ones, but still a nice change from regular white mushrooms. They were also small enough that I just cooked them whole. 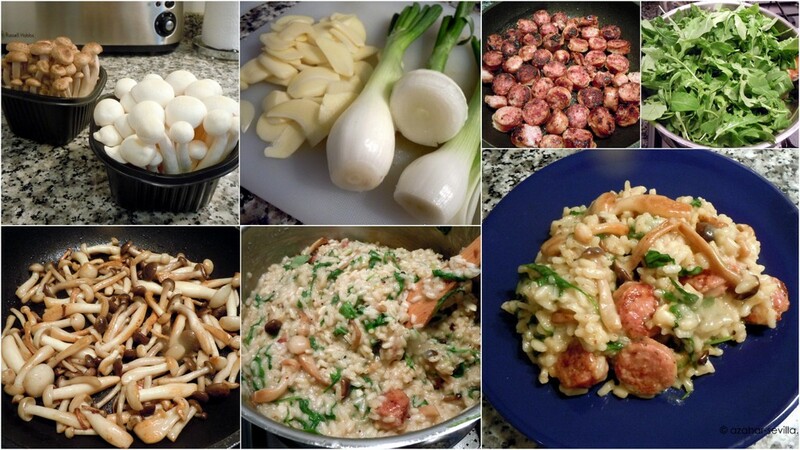 And thus a new (for me) risotto was born. 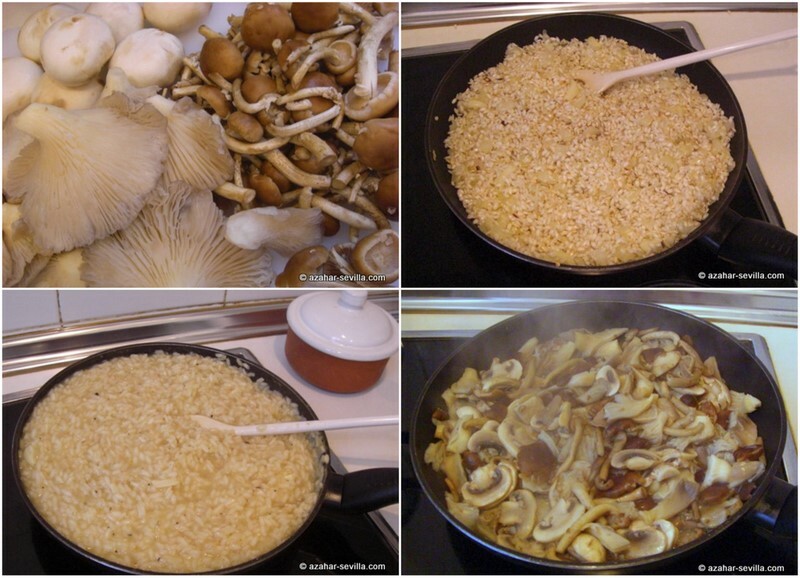 The other day I fancied a bit of risotto without making a whole whack of it like I usually do. So I came up with this “single serving” option using basmati rice. It turned out very nice though I didn’t actually measure stuff so just use the amount of rice you’d usually make for yourself with a bit more broth than you’d normally use if cooking it with water. 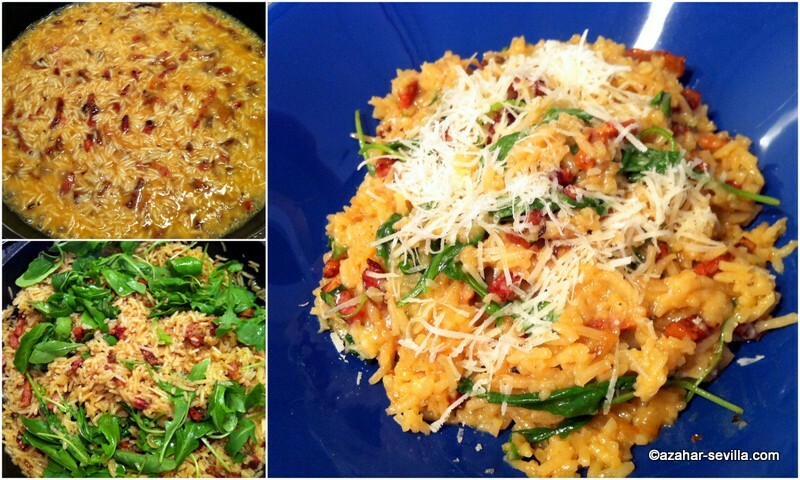 Yep, another risotto. This one with fresh baby spinach leaves stirred in at the end – it’ll look like a lot of spinach at first but it wilts down a lot. Also very meaty with lots of chorizo criollo, which adds a lovely texture and flavour and goes very well with the langostines. Add some ground hot chilis to spice it up. Ingredients & instructions below the links. It’s asparagus season in Seville and so I am always looking for different ways of preparing it. 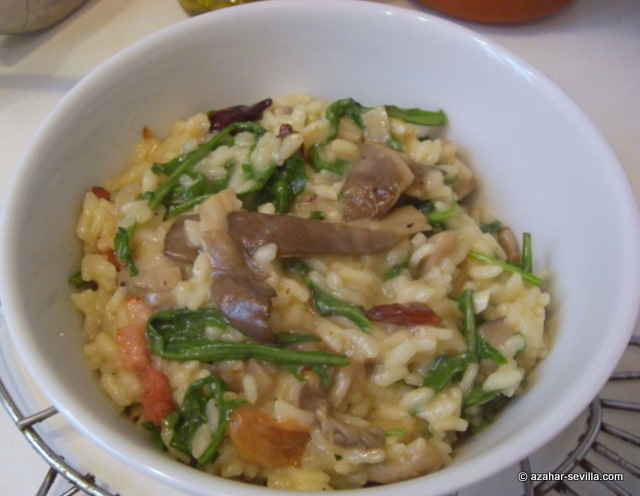 I’d never had an asparagus risotto before and thought … well, why not? It was gorgeous, with the addition of langostines and two kinds of mushrooms. And of course I saved enough asparagus to give to the cats as a treat. Yeah I know I should be low-carbing, but every now and then I just need a good ol’ carb fix and I can think of nothing more satisfying than a nice risotto. I had started making this one with broccoli florets, then thought to try it with fresh arrugula, as in this penne & arrugula dish, and it turned out fabulous. 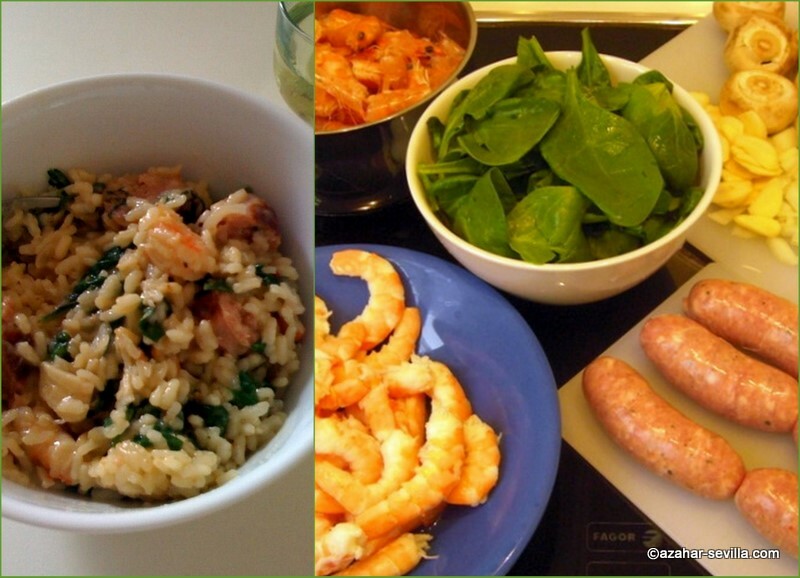 Since making my first ever risotto a couple of months ago they have become a staple dish here at casa az. 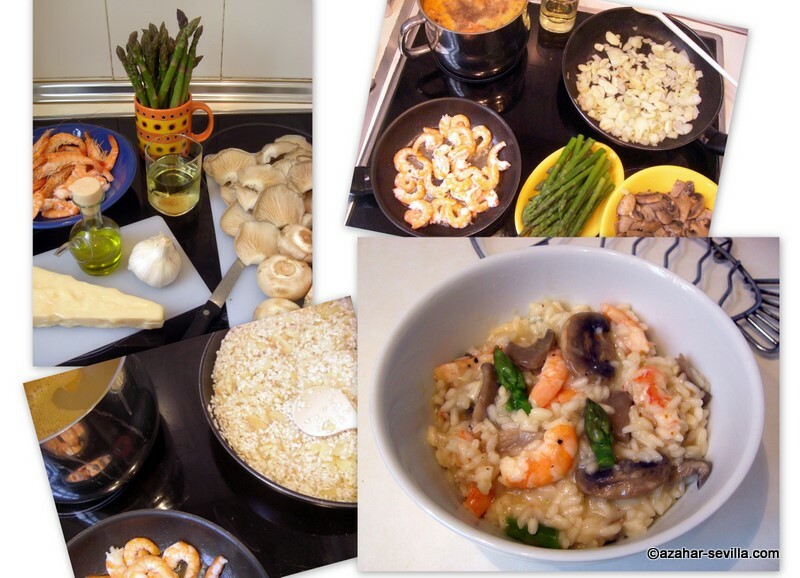 Until now I’ve been sticking with mushroom & veg versions … that is, until my pal WeeRascal boasted of having a chorizo & lobster risotto a while ago. And well, I just had to try it out for myself, though I substituted giant prawns (gambon gordo) for lobster. 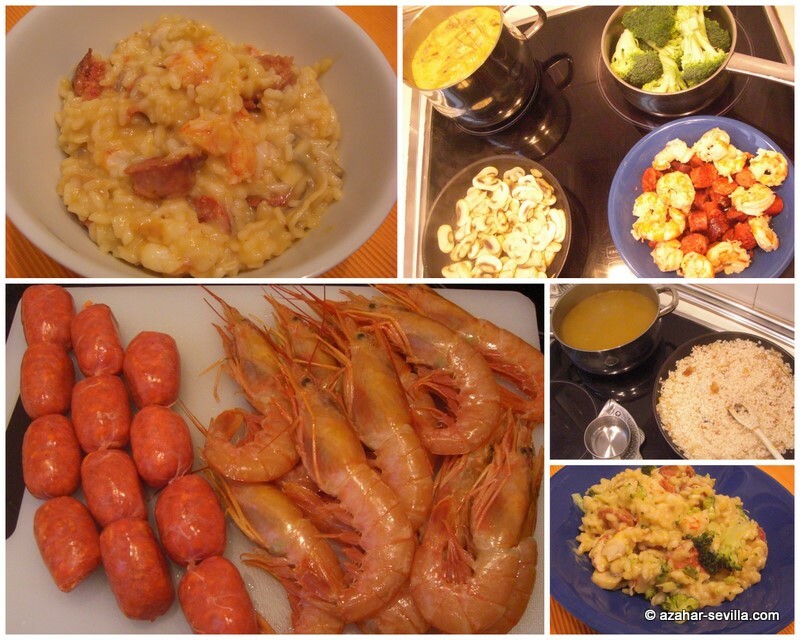 I made it pretty much following the same recipe as the mushroom risotto, but I added the heads and shells of the gambas to the chicken broth – and wow! – the broth turned out gorgeous. In fact, I think this is one of the most delicious meals I have ever made. I was a bit unsure about adding too many ingredients, so I tried it first without and then with the broccoli. They were both great, and I liked having some green stuff in there, making it a more complete “one dish” meal. I’ve recently enjoyed a couple of very nice risottos over at Tre Fratelli and at Soravito. And it got my curiosity going as I had never made a risotto before and thought how nice it would be to make one at home, because there is a definite “comfort food” aspect to a good risotto. And so, using my usual modus operandi when trying something new and having no recipe, I took four different risotto recipes that I’d found on line and adapted them into one recipe I thought would work well. And as you can see, it turned out very well indeed. 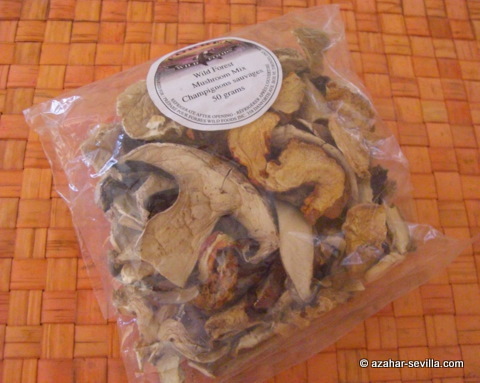 I couldn’t find any portabello mushrooms and used setas de chopo instead.